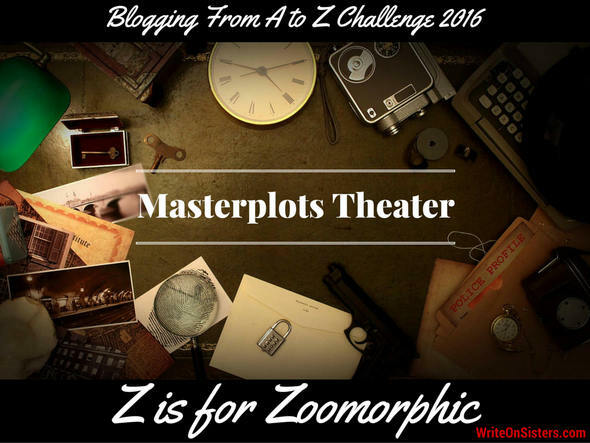 Welcome back to Masterplots Theater on this the very last day of the A-Z Challenge! Yippee! We made it! And as happens every year, we get to Z and go, “What the heck are we going to write for this letter?” Of course, now that I think of it, we could have picked zombies, but I already talked enough about zombies in X is for X Meets Y. So the word of the day is *drum roll* ZOOMORPHIC! Right. So that means most animated animal films, such as FINDING NEMO, ICE AGE, THE LION KING and RATATOUILLE are actually anthropomorphic. Darn. So I went back to the drawing board, aka Google, to research stories where humans take the form of animals, but then remembered that Robin already wrote about the Metamorphosis masterplot. So you know what? We’re just going to go with the basic definition of zoomorphic (“having the form of an animal”) and talk about movies with animal characters that act so much like humans that we can pretend they’re humans in animal form. Okay? Because Z is a difficult letter and we can cheat a little. The defining element of this somewhat made-up masterplot is that the characters are animals that act human, so much so that they talk like us, walk on two legs, and wear clothing. In this way, FINDING NEMO does not fit in this category, but FANTASTIC MR. FOX does. The setting resembles human civilization, with the animal characters living in houses and cities, getting married, having jobs, and even establishing organized leadership such as royalty or government. Probably the most significant characteristic of this plot is the moral issues it addresses. The animal society mirrors human society, including all the problems and -isms (racism, sexism, classism) that we deal with. Common masterplots that zoomorphic stories fit into are Rite of Passage, Quest, Adventure, and The Fool Triumphant. · CHARACTERS: They are all animals who talk, have human-style relationships, and work people jobs. They also wear clothes, and there is a hilarious scene in a nudist yoga centre that makes light of this. · SETTING: Zootopia is a modern city with houses, businesses, roads, transit, technology and government. Heck, the bunny protagonist even has a smart phone that she uses to call, text, listen to music and take photos. It doesn’t get more human than that! · MORAL ISSUE: Racism. Because what better way to send a “we should all live in harmony, no matter our differences and our history” than to put a bunch of very divergent animals together in the same city, some of whom used to be “prey” to the others. 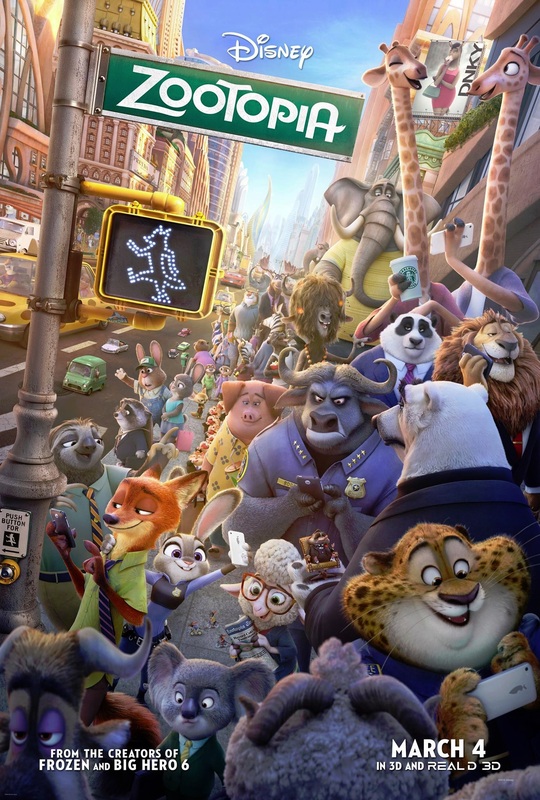 · MASTERPLOT: Zootopia falls under the Fool Triumphant category because 1) the protagonist (Judy Hopps) is a bunny that nobody expects to succeed because bunnies aren’t supposed to be police officers, 2) she’s up against the Establishment (police force) who discriminates against bunnies, 3) she gets a name change when she passes cop training and becomes Officer Hopps, 4) the film sheds light on a serious moral issue through comedy, and 5) the disregarded protagonist exposes the establishment as the true fool, and everyone lives happily ever after. Stories that fit my Zoomorphic Masterplot criteria: FANTASTIC MR. FOX, MICKEY MOUSE and DONALD DUCK films, THE SECRET OF N.I.H.M., and REDWALL. And that’s it! The April Blogging A-Z Challenge is finished! Thanks for being part of Masterplots Theater. We sincerely hope you enjoyed the show. Oh wow, I think I read that book as a kid, but I didn’t remember the title. I remember reading about a Toad, though. Thanks for reading, Andrea! Thanks for the series. I think you earned to cheat a little on Z after all the hard work you’ve done. Congrats on beating the challenge. Absolutely LOVE this genre. My favorite might be An American Tail, such charm to the characters. Also, must mention the book Watership Down, a classic that I read about 40 years ago – I think I’ll read it again. Took my grands to see Zootopia. We loved it and will certainly see it again. Wonderful story. Thank you, Robin and Heather, for an amazing exploration of books in all their plotted glory. I’ve added at least 50 books to my list of I-must-read-this. Well, if they ever filmed my Princelings series you could include that 🙂 I’ve enjoyed your Masterplots greatly, although I’ve missed out far too many. Plenty of time to come back, and I have you on my Pinterest board, so I can’t lose you now! Congrats on finishing your A2Z – and in such style! True, MG stories definitely employ the Zoomorphic masterplot a lot! Glad you enjoyed it! Thanks for reading, and it was great to meet you via the #AtoZChallenge. Thanks for all your wonderful ideas. This has been an adventure. Thanks for playing. I enjoyed it so much. That makes us so happy, Laurie! So glad you found the series useful. Thanks for reading and commenting! So many books and films I’ve enjoyed in this genre! Me too. 🙂 Thanks for reading and commenting, Noelle! I wrote animation for years, but still watch anything that comes out of the Pixar brain trust with absolute awe. Also, remember that animation is a team project – there are writers, editors, producers and directors all honing that script to make it shine. J here, of the #atozchallenge Arlee Bird’s A to Z Ambassador Team. Have you enjoyed the challenge? Did you hop to other blogs? The end of the alphabet here! Reflections sign up is May 9– mark a calendar. My blog’s giveaway is still going. I’m encouraging everyone to visit more stops. Any post that mentions Zootopia is all right with me! Good job on fudging this to perfection. I’m not very fond of zoomorphic stories. Usually I prefer humans to b humans and animals to be animals and I think they give their best (alone and together) when they respect their nature. But this said, I think there are very good examples of this plot that really work. ‘Watership Down’ is one of my very favourite, but I really enjoyed ‘Animal Farm’ too. I have a very fuzzy memory of Animal Farm, and Watership Down is a series I’ve never read. I’ll have to reclaim my childhood and check it out. Is anthromorphic the characters in comic books like Sonic the Hedgehog, but once they become live as In a movie, it that when they turn zoomorphic? Thank you for a wonderful educational series. I’ll have to go back and read the ones I missed and take notes. ;). Spent so much time roaming, didn’t have time to read them all. Glad you enjoyed the series, Robin! As for your question, I’m kind of making of my own definition of a Zoomorphic plot, but it’s really just animals who act human, whether in books or film, rather than animals who talk but otherwise still act like animals. Thank you all so much for this wonderful series. I’m going to miss it! Next Next post: Story Twinkies: Do You Need One?